Trying to capitalize on its offensive in Iraq, the Islamic State held a military parade in Raqqa in northern Syria on Monday. The Iraqi-led group, which has held Raqqa — the largest city outside regime control — since last year, showed off a SCUD missile and US-made howitzers captured in Iraq’s second city Mosul. 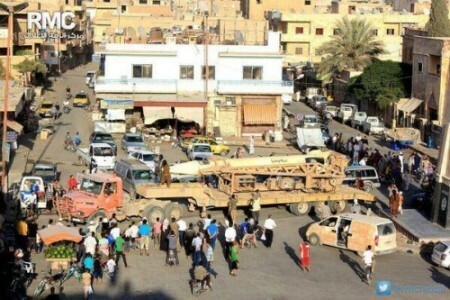 The only danger that Islamic State scud is to anyone at the moment is if they accidentally run over a pedestrian showing it off. Meanwhile, the Islamic State and insurgents continued to fight in Abu Kumal, the town in eastern Syria on the Iraqi border, almost a week after the Iraqi-led group tried to claim control. The Assad regime signed a $264 million deal with a Russian firm on Monday for the first phase of an irrigation project in northeastern Syria near the Turkish and Iraqi borders. The project, planned before the start of the uprising in March 2011, aims to draw water from the River Tigris in Hasakeh Province. The regime still controls Hasakeh city, but most of the province is controlled by insurgents, Kurdish militia, or the Islamic State. The regime’s master plan aims to irrigate about 214 million hectares (530 million acres) at a total cost of more than $2 billion. Sharia councils of the insurgency have rejected the Islamic State’s declaration of a Caliphate. The councils said in a statement that the Caliphate was motivated by self-interest, without taking into consideration the well-being of the ummah (Islamic community), “The announcement by the rejectionists of a caliphate is null and void, legally and logically.” It sought to “abort the blessed revolutions in Syria and Iraq”. The statement, signed by the Islamic Front and by a coalition of insurgent groups in Deir Ez Zor Province in eastern Syria, maintained that the Caliph — the Islamic State’s leader Abu Bakr al-Baghdad — has to be acknowledged and accepted by the entire ummah. Describing the Islamic State as a deviant group, the councils said fighters in Syria and Iraq should close ranks against it and cautioned “Muslims and all jihadist factions from putting their capabilities” at the disposal of the Iraqi faction. Insurgents and regime forces have reportedly agreed to a 20-day ceasefire in the al-Waer section of Homs, as negotiations over its fate continue. 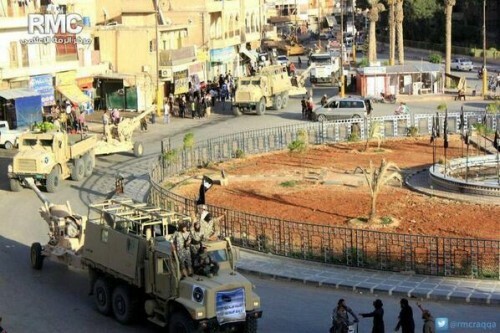 Insurgents evacuated almost all sections of Syria’s third-largest city in May, after an occupation of more than two years, but remained in al-Waer. The neighborhood is home to many thousands of displaced Syrians. The opposition site All4Syria said an agreement will include a lasting ceasefire and a prisoner exchange. Vegetables are plentiful, as Deir e-Zor is an agricultural province and produces some crops and vegetables such as tomatoes and cucumbers….Other foods like rice, sugar and oil come from Turkey if the crossing points are open. Even if a bakery is able — somehow — to secure a quantity of flour from neighboring countries, or aid organizations, or from a donor, the price of bread is high and the number of loaves few, so fights often break out over a bag of bread. A number of people rely on homemade bread. Al-Ahmad said both the Islamic State and its rival, the Islamist faction Jabhat al-Nusra, distribute food and bread “as the essential ingredient in gaining popular support”. The sewage system is getting worse and no one is fixing it. We don’t have electricity most of the time, sometimes for days and months, and the water is connected to the electricity. Health care is limited to field hospitals and some relief services for civilians operated by the hospitals. The Islamic State is demanding $1.4 million to release 31 Turkish truck drivers whom it abducted three weeks ago, during the capture of Iraq’s second city Mosul. An official from the trucking company, after speaking to a hostage, said the Iraqi group is insisting on $50,000 in ransom for each of the 28 trucks seized as they brought diesel fuel to Mosul. The Islamic State also abducted 49 staff and dependants from the Turkish Consulate in Mosul, and it subsequently kidnapped Turkish construction workers, along with nationals of other countries.